There are times when commercially available sections of Unitrack just don't fit. Although Unitrack has an adjustable track section, I've always been leery of such things. Slicing and dicing a custom piece of Unitrack isn't difficult. You'll need a razor saw that hasn't lost all of its teeth. 1) Measure the length of track you need. 2) Saw a suitable piece of Unitrack to a hair less than this length. 3) Look at the factory end of the piece of Unitrack. Notice the gap under the ends of the rails. Cut similar notches on the cut end. 4) To join your track to factory Unitrack, use 'standard' Atlas rail joiners. I'd recommend using the cut end deep within the module; the Atlas rail joiner doesn't have the same grip that the Unitrack joiners do. Rail nippers could cut the rails quickly, but nippers have a nasty tendency to squeeze the cutoff piece of track out of the Unitrack-- in this situation, I think the razor saw works better. Especially since Unitrack has the ballast embankment to deal with, too. With very short pieces of track I'd also recommend soldering the joints once you've got the lengths adjusted. Otherwise, you'll find things 'adjusting' themselves! "I've found a relatively simple way of trimming Unitrack. Look at a piece carefully. You will notice that at one end there are a couple of stake marks on the rail to fix the rail to the base. Call this the fixed end. With a razor saw, cut [only] the base about 1/2 [of the desired finished] length from the the fixed end. For appearance's sake, it helps to do this in the ballast, rather than the tie area. "Slide the base off the free end. Cut the removed section of base to the remaining desired length. File the ends of the base for exact fit if needed. Slide the free base back on. Glue the base together with liquid styrene cement. Reinforce if necessary with lengths of styrene strip. Let dry at least two hours. Cut off wild rail flush to end of base with rail nippers. This can be done with straights to get custom lengths and with curves to get odd angles of curvature." "After a week or two of careful thought and now half an hour of playing with flexible track, Unitrack, and a Dremel motor tool I may be on to something very good: Code 55 Continuous Welded Rail for T-Trak. "STEP 1. Take a length of Peco Code 55 flexible track and cut two pieces 310mm long. "STEP 2. Take two 128mm Unitrack straights and cut through the plastic BALLAST BASES (and not the rail) from underneath approximately 50mm from each end. You will find that the centre section and one of the end sections will slide off the rails quite easily. "STEP 3. Closely examine the section of Unitrack that still has the rails attached. If you look closely at the rail near the rail joiners you will see some little `notches' that have been pressed into the base of the rail to secure it in place on the track base. Using a pair of pliers or similar tool to securely grab onto the rail, gently pull it out of the track base in the direction along the track base and AWAY from the rail joiner. A close look at the notches will let you know which way to pull the rail so that it will not `catch'. It is a bit tricky to do, but not too hard if care and thought is taken. "The result of steps 2 and 3 should be two 50mm long pieces of Unitrack base with rail joiners attached. "STEP 4. Taking the 310mm lengths of Peco Code 55 remove 50mm of sleeper webbing from each end. "STEP 5. The top flange on the bare Peco Code 55 can be a bit tight on the Unitrack rail joiners and so use a Dremel Motor Tool (or similar) and a cutting disc to carefully grind away about 5mm of this top `flange' on both sides of each end of each rail on the 310mm lengths. This 5mm end should now resemble conventional Code 80 rail in profile. "STEP 6. Carefully slide the Peco Code 55 into the chair/spike mouldings on the Unitrack bases from the cut end, not the rail joiner end. You should end up with two 310mm lengths of track with Peco sleeper webbing in the middle and Unitrack bases and rail joiners on the end ready to fit straight on to your module. "STEP 7. (Still to be trialled) Cut appropriately sized styrene strip to make new sleeper sections to glue on top of the existing Unitrack sleepers and have the tops line up with the top flange on the Peco Code 55 rail. "STEP 8. Paint the new sleeper sections and the rest of the track an appropriate track colour (don't forget to mask off the end 5 or 6mm where the Unitrack joiners have to have clean rail to make a good electrical connection). When dry, ballast. "The finished look should be quite good. "In place of a 128mm Unitrack straight you could cut a 62mm straight directly in half and probably have the rail held fairly securely. "I have done STEPS 1 to 6 using Peco Code 80 with good results. The process cuts the track costs considerably and can even be used on corner modules, the details of which will be posted in about a week or two when the grey cells are again in good order and not committed to vocation, family and other stuff. "This work is still at the experimental stage and I would appreciate someone doing the `scientific' method and trying it for themselves just to see if both the process (and my instructions) make sense and are workable. If someone wants to write up some better instructions, add photo's etc. and post it on either this Group or on their own web-page, GO FOR IT! When the T-Trak standard was created, the two mainline tracks were spaced on 1" (25.4mm) centers; butting the two tracks together, side by side. When modules ran the tracks down a street, the resulting look was just like the trolly/tram lines down the middle of Main Street. This track spacing resulted in the 'swervy' corners with 4 pieces of Unitrack of the same radius, plus a handful of short filler pieces. Although the track spacing caused no problems with motive power or rolling stock of any size, spacing on the corners could result in -very- near misses. Plus, longer equipment had severe 'overhang,' resulting in non-prototypical appearance. The Basic 25.4mm track spacing did not allow the use of the Unitrack double crossover, truss bridges, and elevated causeway pieces, all of which use the Kato 33mm track spacing. An 'Alternate' standard was created, which uses this 33mm spacing, and allows use of these pieces. The Alternate 33mm track spacing standard uses 282mm and 315mm radii track on the corners, maintaining the 33mm spacing throughout the curves. These radii, on 14-3/8" square bases, handle just about any piece of equipment with minimal overhang. Of course, having 2 incompatible standards means that if you want to use old and new modules together, you'll need adapters. The adapters (you'll need 2) fit on single-wide modules. The front track continues straight across, and the gap between the tracks widens from 0mm to 8mm separation. The modules should be mirror images of each other. Using multiple pieces of track on the rear track will distribute the 8mm of swing required among 4 rail joints. As an alternative, use flex track and Unitrack to FlexTrak Adapters. I'd recommend leaving the 33mm end of the rear track loose, to allow for any variation in track spacing. After a while, a layout that's just a plain oval gets a bit boring. Or maybe the display space is limited, and you can't get the space you need in a straight line. So you make an "L" shaped layout. That's when these inside and outside corner calculations will come in handy. Each layout requires 5 'regular' corners, and either a special inside or special outside corner to complete the layout. The calculations, below, will help you figure out how to construct the inside and outside corners needed to make the "L."
I've figured out the general formula for each corner type, and plugged in the values for three sizes of T-Trak corner: using 216mm, 249mm, or 282mm radius track on 12-1/4", 13-1/2", or 14-13/16" square corner modules. For the Inside corner, I assume you'll be using 5 corners the same size, plus the special Inside Corner. If you click on the diagram (above) that just shows the 'answers,' you can see the diagram with the calculations you'll need to make for any general situation. As the numbers show, as the size of the corner modules grows, the square size for an inside corner shrinks. This means that for some large radius corner, an inside corner will be impossible! Joe Price encountered this problem when calculating an inside corner for a T-Trak-HO layout! 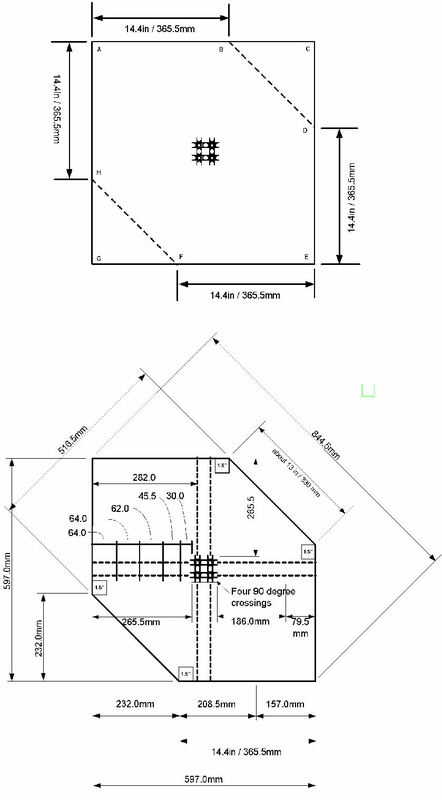 I've looked over my 'general case' calculations, and I think that as a rule of thumb if the dimension "T" (the square that surrounds an inside corner module) is less than the size of corner you have selected, the inside corner module will fit, but you won't be able to make the track fit! In that case, re-do the calculations with -3- straight modules on the outside legs of the "L."
For the Outside corner, I've figured out formulae so you can use different radius corners, as long as the 2 U-turns each use two identical corners. If you click on the diagrams that just show the 'answers,' you can see the diagrams with the calculations you'll need to make for any general situation. Joe Price's "Colt 45 Corners"
Joe Price decided that a simple offset module (see the "Mainline Modules" section) didn't add quite enough variety to T-Trak layouts. So he designed his "Colt 45" Corner Modules. Built to mate with T-Trak layouts, each corner travels only 45 degrees of arc, 1/2 a 'regular' corner. As you can see, the corners are only a little bigger than a 'standard' module! Notice how 2 Colt 45's and a 'standard' straight make a table-wide offset module! Here's how Joe built his Colt 45 corners. He accepts the nickname, but insists he didn't name them! "My method for building the 45° corner modules is a very low-math one. First, I choose the inside and outside radii to be used (I am assuming two tracks on the module.) So, I’ll use 315mm and 282mm for the curves. "Yep, it’s normally 50mm from the front edge to the track centerline, but hang with me about this 5mm offset. "Referring to the drawing, choose a square corner on the plywood sheet to be used for the top, and call it point "A." Measure down one edge 360mm from "A" and mark point "B." Measure the same 360mm along the other edge from "A" and mark point "C." Connect "B" and "C" with a straight line. "From "B," measure 360mm towards "C" and mark point "D." Carefully draw a line at a right angle to "D" so that it crosses line AC. Mark this as point "E." Measure "A" -> "E" and "E" -> "D." They should be equal. If not, recheck your points, and especially, the 90° corner at "D."
"Next, measure 227mm from "B" on each line, and mark "F" and "G." Connect "F" and "G" to complete the module top diagram. "A" -> "F" and "D" -> "G" should be equal." [Joe's been describing the right-half of this diagram-- using 282 and 315 mm radii tracks. Joe's also built larger corners, using 381 and 414 mm radii track. That's the left-half of the diagram. The "Dueling Corners" picture at the beginning of this section shows the larger size half-corners. The circles on the diagrams show the key dimensions for the modules. If you have a compass that will stretch to 18" radius you could use it to help lay out the modules. The solid circles are the inner and outer edges of the modules, and are another way to mark distances B-F, B-G, B-A, and B-D. The dotted lines are the center lines for the two mainlines of track. The measurements for the larger corners are: Larger Radius + 45 mm = 414 + 45 = 489 mm. Joe shows this dimension as the distances A-B and B-D. And the 2nd measurement is Smaller Radius - 55 mm = 381 - 55 = 326 mm. This marks the distances B-F and B-G. The 'square corner' Joe mentions is marked "A" on the diagrams. The figures A-B-X-C are squares. If you are careful with your measurements, you should be able to outline a 2nd module inside triangles B-C-X. Watch the saw kerf! The first modules are figures A-F-G-D-E; you get another module from the mirror images across lines G-D.
Joe continued, "Once everything is satisfactory, let’s make some corner blocks for mounting the feet. Set your table saw to 22.5° to make the following rip cuts in the end of a length of 2x4. The first cut yields bracing blocks for "F" and "G." The second cut gives the block for "E." Crosscut the pieces to length. "While you are at it, saw a 22.5° bevel the ends of five fascia strips to make assembly a bit easier. You can use the top to figure the lengths you need." [The diagrams show the end views of 2 pieces of 2 x 4 lumber. Once you make the indicated cuts, you turn the 2 x 4 sideways and cut off lengths the height of your module. "When it’s time to add the track, you will find it fits flush to each end. So, slide it 5mm (yes, "that" 5mm) towards "B" to give a slight overhang at each end. "That’s about it, folks. Enjoy, and send me pictures of what you build." Although these corners use track with radii of 282 and 315 mm, wider corners using 381 and 414 mm track are a simple calculation away! If you're setting up your T-Trak layout to minimize space-- a layout on top of the row of book cases in the den, or in that long, skinny space under the eaves in the attic, perhaps-- you'll probably need a pair of these Return Loops, or a pair of Junction Modules (see below) to complete the circle of track. Be warned! If you use crossovers or double-crossovers along with end loops anywhere in your layout, you must wire your layout with a reversing section, or suffer from a short circuit! Note that I haven't actually =built= one of these return loops. These end loops are designed to use existing corners-- you could still take the corners to an exhibition. You could create the loops as stand-alone modules, which incorporate the entire loop. Building the return loops will require cutting one or more pieces of track to complete the loop. This is a good place for flex-track and snap-to-Unitrack adapters. 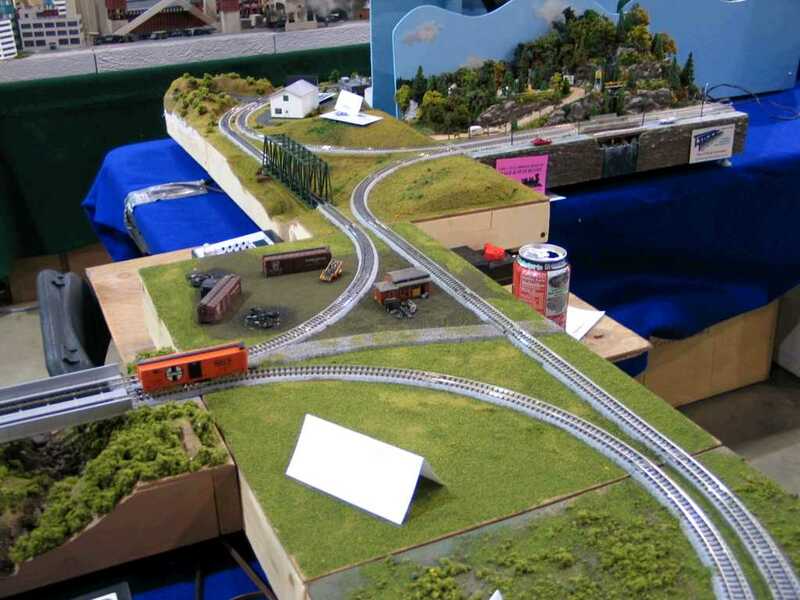 "The NTRAK club that I am in uses junction modules to connect multiple loops together allowing us to have one long mainline run and several smaller internal loops to keep plenty of trains running for the crowds. It also allows us to break out of the 'running in a circle' mold. "Are any of y'all working on T-Trak junctions? The junction would be 14 3/8 x 23 7/16. 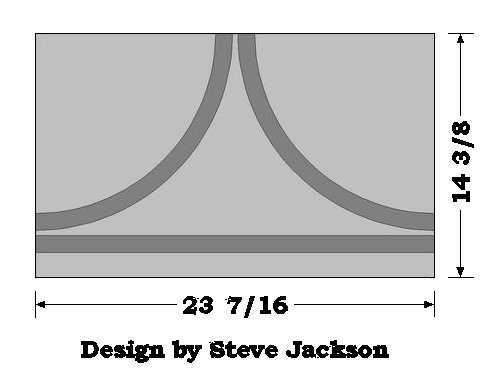 The curved sections are the same that you use for the alternate [33mm track spacing] corners' inside tracks. The straight section would have to be done with flex track or a Kato expansion track since 23 7/16 does not convert to Unitrack-friendly units." Steve actually built his junctions with a custom-cut length of Unitrack and avoided the expansion track. This is longer than the 597 mm needed, but with careful adjustment of the curved sections should be workable. "The main issue with this concept so far is that you can end up with an s-curve that has no tangent. 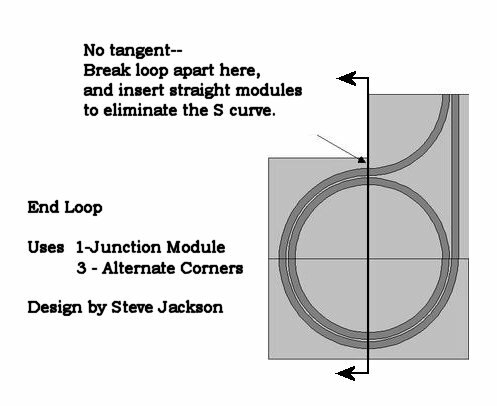 The referenced pics show it without this problem, but if you used it as an end loop and draw out the junction plus 3 corners, you will see the S."
One solution to Steve's problem with the S-curve is to insert a couple of straight modules in the loop. This makes the loop bigger, but eliminates the S-curve. Or, you could run short equipment that wouldn't be as sensitive to the S-curve! In most cases, a Junction Module will be used at the junction (!) of 2 tables to make an "L" in the layout. This means that one corner of the junction module will be positioned over thin air (unless a piece of plywood is placed over the tables). In many cases this extra plywood can be eliminated by building the junction modules with 5 legs instead of 4! This extra leg, positioned where both curved tracks come together, will support the module and keep it from toppling off of the table and into the abyss. You can actually get away with only 3 legs, at the 3 points where tracks leave the module, but the 'extra' 2 legs will provide support and confidence. The area of the module suspended in space is about 25% of the junction; the mass of the remaining portion will keep the module anchored to the table unless you build your model of the lead foundry (made of genuine lead) on one of the corners of the junction! The Unitrack connections to the adjoining modules will also help to anchor the module to the top of the table. Brian Heil has been designing modules as well. His addition to T-Trak is a module that will turn a T-Trak layout into a double-track figure-8 layout, complete with all of the possible collisions that includes! There are two of these lurking in the diagram just above. Looking at the plan, the module is an irregular hexagon. Start with a square 23.5 inches on a side. Starting from 2 opposite corners (A & E), measure 14-3/8" along the sides, and mark four cut points, at B, D, F, & H.
Cut along lines B-D and F-H to lop off two alternate corners and make the hexagon. Alternate straight or corner modules will connect to sides AB, AH, ED, and EF. The module requires 4 Kato 90 degree crossings, plus 8 lengths of Unitrak 265.5 mm long. This is not a length possible with standard sections; you'll have to use 8 adjustable sections, or make fillers of your own. I'd suggest 186.0 (standard) + 79.5 (custom) for each of the 8 lengths. PS-- Brian hasn't actually -built- one of these (yet). Because of the probability of collisions when running a double-track figure 8, some kind of control is necessary to limit the damage. The wiring diagram below shows one wiring scheme that will block nearly all collisions by only powering tracks in one direction at a time. Ideally, an automatic detection circuit would switch things so the first train to the module would get the power. When the first train cleared the module, the other train would be powered. Both tracks in one direction would be powered at once. The only situation where this would be a problem is if a train were running backwards, or had a pusher engine at the back. In either case, the train could be pushed through the junction before the engine hit the dead zone. Gomez Addams would be -so- proud! Mike Moore posted a diagram of a layout using a double-double crossing mounted on a junction module base, plus 2 special single modules. One special module is 14-3/8" x 9.13". The second is a straight module built on a Jackson Junction base. a small 'filler' module, and a straight module built on a Junction Module base. I discovered the Brian Heil's "Double-Cross" module would fit in the same footprint. See folder "North Texas T-Trak" (http://groups.yahoo.com/group/t-trak/files/North Texas T-Trak/) for some more diagrams using Mike and Brian's modules. Same diagram, replacing Mike's module and the small filler with Brian Heil's Double-Cross module. Joe Price saw the possibility of even more collisions, and designed this double-double-cross layout! And here's another use for extra corners and junction modules. I recently found an old diagram using 4 of Brian's modules to form a Quad (4-armed) Hub layout. Not content to leave well enough alone, I discovered that the footprint of Brian's module allows at least 4 different track plans that allow a variety of hubs! The 4 track plans that fit on the footprint of Brian Heil's Double-Cross module. (upper left) "Star" curves. It appears that all curves are 282 mm. Close-ups of the quad hubs from the layouts below. Yes, I got carried away! Here are 6 layouts using the various track plans in various combinations. Mix and match as you see fit! At the 2006 NMRA National Train Show in Philadelphia, Lee Monaco-FitzGerald (pictured here) presented her Star Junction. She used custom hub modules to bridge the ends of pairs of tables to form a 6-pointed star. 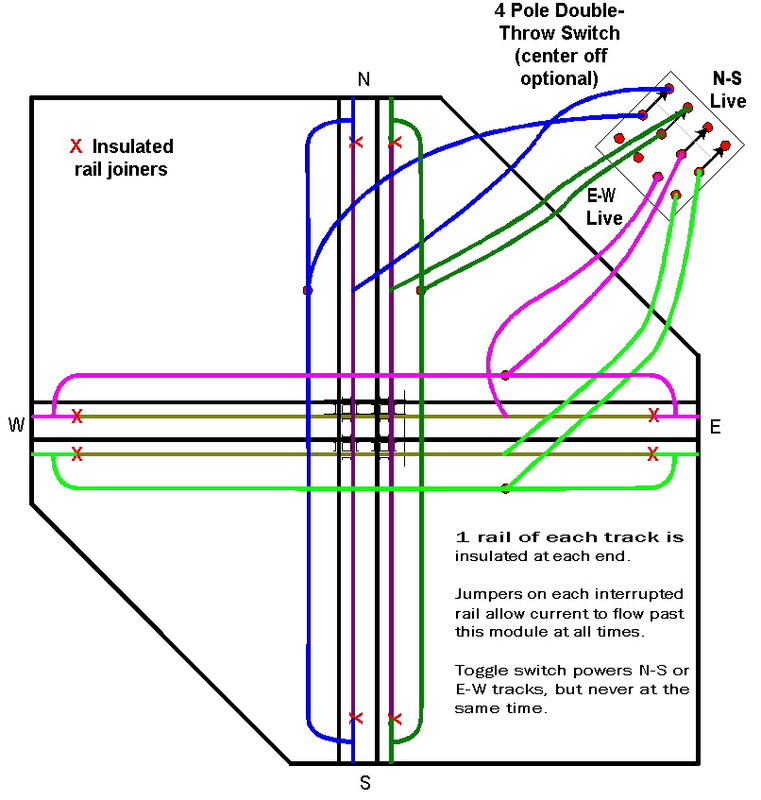 A Double-Crossover on one of the tables let trains loop thru the inner main then switch to the outer main. A carefully-selected LONG train almost lapped itself traversing the layout-- it was fun to watch the near-collision. You can mix and match the table lengths to suit the available space and modules. The central hub is not quite 4' across-- a good spot to place a sign advertising the layout. Each hub module is about 43" across the tips, and just under 20" deep. When building your modules you should be able to layout 4 modules on a sheet of 4' x 8' stock with room to spare. If you look closely at some of the layout designs and look at the track that circles the central hub (the track that includes the straight sections), Lee's original design split the 60 degree curve into two 30 degree segments with a longer straight section in between. In some of the layout possibilities shown below this caused some "S" curves. I've taken the liberty of re-arranging this track so all 60 degrees of the curve are in one spot, with the straight section split into two pieces. This cures many of the "S" curve issues. The 60 degree track section between the straights can be almost any radius (with larger being better). You'll have to adjust the length of the straight segments to compensate for any changes. The dimensions of the hub modules are for modules built with -perfect- craftmanship. For the rest of us, "Take the line" when cutting-- that is, lay out the module as shown, but when cutting cut -on- the line, making the module just a hair smaller than the plans shown. That will let the Unitrack hang over the edge and lock onto the next module. A hub module is about 3 Alternate Corners in area. You can see how the hub replaces corner modules from 2 adjacent tables. This accounts for the area of 2 Alternate Corners. The remaining area, which bridges the two tables, is about 1 Alternate Corner in area. If you divide a corner module into 3 triangles, you can place the pieces on the hub module, and they fit nicely around the area occupied by the Alternate Corners. With 2/3 of the hub module over tables, it should be stable without clamps or bolts. The yellow triangle is about 1/2 of a corner module in area, as is the combined area of the red and green triangles. Although designed for use as a central hub with radiating arms, the geometry of the Star Junctions lets them be used for a variety of alternate layouts. The only drawback to some of these designs (the "C"-shaped layout, for example) is that they have 'S' curves, making some of the tracks suitable only for shorter equipment. NOTE! Most of the layout designs are shown using 6-foot tables, not 8-foot! Plan accordingly! Vic and Kelly McTee were instrumental in building 6 of these hub modules for the North Texas T-Trak club in Plano, Texas. They were first used at the 2009 GTE show and were an immediate hit. Vic commented, "My construction skills were a bit wanting for these. The angles have to be dead on or track will not have enough overhang to permit connection. So either the construction needs to be much more precise, or the dimensions [of the hub modules] reduced to allow for "more slack." The McTee's hub modules at the 2009 GTE show (Ft.Worth, TX). They were set up in one of the alternate configurations to make a 3-pointed "star." Photos by Mike Moore for North Texas T-Trak. The following double crossing layout raises one set of tables above the other to allow a table-width crossing. The tables with the upper track need to be raised; try 4x4 blocks under their legs. The upper table line requires 2 table-wide bridges or causeways to span the gap! An extensive upper layout will require a lot of blocks; plan carefully! I've always liked the bridges built by the Delaware, Lackawanna, and Western Railroad (DL&W) across the Paulinskill, Delaware, and one other river location I can't remember right now. The viaducts were compound arches, and were a LOT taller than can be accomodated even by raising a T-Trak module to 4" running height! Of course, this will require special tablework-- first, a lower table to support the deeper bridgework, second, a partner bridge to fill in the opposite side of the table. Maybe this is the bridge to use with the elevated crossing tables!